500 Watt SMPS POWER SUPPLY UNIT: Super Silent Power Supply. 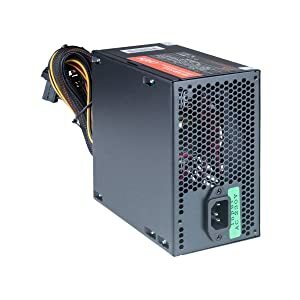 Dual and Individual output coils, 12cm cooling fan with speed control for excellent thermal control, 70% High efficiency protection, PCI-E Ready for compatibility with NVIDIA and ATI/AMD Radian graphic cards, Longer DC Cable Supports PSU-Bottom Set Cabinets, Built in industrial grade protections: Over Voltage, Under Voltage, Short Circuit protection, Max Output: 500W, Safety /EMI Regulations: CE, FCC, CB, CCC. I/O: 20+4 Pin x 1, SATA HDD x 4, EPS 12V(4+4) x 1, Molex x 2, PCI-E P6 x 1, PCI-E P8(6+2) x 1.